In 2010, we chemically synthesized the 1078 Kb Mycoplasma mycoides genome and transplanted it into a recipient cell cytoplasm to create a ‘synthetic cell’, JCVI-syn1.0 (Science, 329, 52-56, 2010). We identified several hundred non-essential genes by Tn5 transposon mutagenesis and deletion analysis. We divided the genome into 8 overlapping segments which were redesigned with non-essential genes removed. Each of the minimized segments was then tested individually, or in various combinations with ‘wild type’ syn1.0 segments. After several cycles of design and testing we achieved a viable 574 kb genome with 38 RNA genes and 478 protein coding genes. 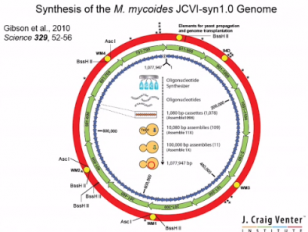 When installed by transplantation, the resulting cell, JCVI-syn2.0, grows continuously in independent culture and has a genome smaller than that of any such cell found in nature. It is our working model of a minimal cell, the result of a compromise between small genome size and an experimentally useful replication rate.